Christopher Giza graduated from Dartmouth College, received his M.D. from West Virginia University and completed his internship at the University of Pennsylvania. Dr. Giza then trained in Adult and Pediatric Neurology at UCLA. He then worked on the Yosemite Search and Rescue team before joining the UCLA Brain Injury Research Center. Dr. Giza traveled to Afghanistan in 2011 as a civilian advisor to the Department of Defense. Dr. Giza co-Chaired the American Academy of Neurology’s committee that developed an evidence-based Practice Guideline for Managemen of Sports Concussions from 2009-2013. He currently serves on advisory committees for TBI/concussion with the CDC, NCAA, MLS and USSF, and has been a clinical consultant for the NFL, NHL and MLS. 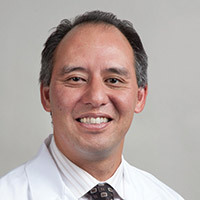 He is currently Professor of Pediatric Neurology and Neurosurgery at the David Geffen School of Medicine and Mattel Children’s Hospital and director of the UCLA Steve Tisch BrainSPORT program. His current laboratory interests include neuroplasticity, recovery from injury, concussive injury, sport-related brain injuries and brain development. Clinical research interests include longitudinal follow-up of both sports concussions and moderate-severe TBI, including the use of helmet biosensors, advanced neuroimaging and genetic markers. The National Sport Concussion Outcomes Study: Phase 1 – The Role of Equipment and Head Impact Exposure on Neurological Outcomes. National Collegiate Athletic Association (NCAA) Sport Concussion Research Study. 2012-2016. Co-PIs: SP Broglio, JT Eckner, CC Giza, KM Guskiewicz, JS Kutcher, M McCrea. High Frequency Oscillation as a Spatially Localizing and Temporally Predictive Biomarker in Childhood Epilepsy. NINDS/NIH R01. 2013-2018. Principal Investigator: JY Wu. Investigators: CC Giza, JT Lerner. Using glutamatergic pharmacotherapy to optimize TBI recovery. NINDS/NIH R01 NS027544-14. May 1, 2013-April 30, 2018. Principal Investigator: DA Hovda. Investigator: CC Giza. It’s Not Child’s Play: Developing an Evidence-Based Approach to Youth Sports Concussions. Joseph Drown Foundation. June 15, 2013-June 14, 2014. Principal Investigator: CC Giza. Augmentation of Cognitive Training in Children with TBI with D-Cycloserine. NINDS/NIH R21. 2014-2016. Principal Investigator: RF Asarnow. Co-investigators: T Babikian, CC Giza. The Ketogenic Diet for Neuroprotection after Acute Brain Injury. UCLA Children’s Discovery and Innovation Institute Seed Grant. 2013-2014. Principal Investigator: JH Matsumoto. Investigators: ML Prins, A Madikians, CC Giza. Babikian T, Prins ML, Barkhoudarian G, Hartonian I, Cai Y, Hovda DA and Giza CC. Molecular and Physiological Responses to Juvenile TBI: Focus on Metabolism and Growth. Dev Neurosci, 2010; 32(5-6):431-41. Cazalis F, Babikian T, Giza C, Copeland S, Hovda DA and Asarnow RF. Pivotal role of the anterior cingulate cortex in working memory after traumatic brain injury in youth. Front Neurol, 2011 Jan 21; 1:158. Hutson CB, Lazo CR, Mortazavi F, Giza CC, Hovda DA and Chesselet MF. Traumatic brain injury induces acute cellular vulnerability to enhanced dopaminergic cell loss via exposure to the pesticide paraquat. J Neurotrauma. 2011 Sep; 28(9):1783-801. Reger ML, Poulos AM, Giza CC, Hovda DA, Fanselow MS. Concussive brain injury enhances fear learning and excitatory processes in the amygdala. Biol Psychiatry, 2012 Feb 15; 71(4): 335-43. Adelson D, Pineda J, Bell MJ, Abend N, Berger R, Giza CC, Hotz G, Wainwright MS. Common data elements for Pediatric Traumatic Brain Injury: Recommendations from the working group on demographics and clinical assessment. J Neurotrauma, 2012 Mar 1; 29(4): 639-53. Prins ML, Alexander D, Giza CC, Hovda DA. Repeat traumatic brain injury: The mechanism of cerebral vulnerability. J Neurotrauma 2013 Jan 1; 30(1): 30-38. DiPietro V, Amorini AM, Tavazzi B, Hovda DA, Signoretti S, Giza CC, Vagnozzi R, Lazzarino G and Belli A. Potentially neuroprotective gene modulation in an in vitro model of mild traumatic brain injury. Molec Cell Biochem, 2013 Mar; 375(1-2):185-98. Matsumoto JH, Caplan R, McArthur DL, Forgey MJ, Yudovin S and Giza CC. Prevalence of epileptic and nonepileptic events after pediatric traumatic brain injury. Epilepsy Behav 2013 Apr; 27(1):233-7. Sanchez SM, Carpenter J, Chapman KE, Dlugos DJ, Gallentine W, Giza CC, Goldstein J, Hahn CD, Kessler SK, Loddenkemper T, Riviello JJ and Abend NS on behalf of the Pediatric Critical Care EEG Group. Pediatric ICU EEG monitoring: Current resources and practice in the United States and Canada. J Clin Neurophysiol 2013 Apr, 30(2):156-160. Giza CC*, Kutcher JS*, Ashwal S, Barth J, Getchius T, Gioia G, Gronseth G, Guskiewicz K, Mandel S, Manley G, McKeag D, Thurman D, Zafonte R. Summary of evidence-based guideline update: Evaluation and management of concussion in sports, Report of the Guideline Development Subcommittee of the American Academy of Neurology. Neurology 2013 Jun 11; 80(24):2250-2257. Kernic MA, Rivara FP, Zatzick DF, Bell MJ, Wainwright MS, Groner JI, Giza CC, Mink RB, Ellenbogen RG, Boyle L, Mitchell PH, Kannan N, Vavilala MS, for the PEGASUS (Pediatric Guideline Adherence and Outcomes) Project. Triage of children with moderate and severe traumatic brain injury to trauma centers. J Neurotrauma 2013 Jul 1; 30(13):1129-36. Abend NS, Arndt DH, Carpenter JL, Chapman KE, Cornett KM, Gallentine WB, Giza CC, Goldstein JL, Hahn CD, Lerner JT, Loddenkemper T, Matsumoto JH, McBain K, Nash KB, Payne E, Sanchez SM, Fernandez IS, Shults J, Williams K, Yang A, Dlugos DJ. Electrographic seizures in pediatric ICU patients: Cohort study of risk factors and mortality. Neurology, 2013 Jul 23; 81(4)383-391. Sanchez SM, Arndt DH, Carpenter JL, Chapman KE, Cornett KM, Dlugos DJ, Gallentine WB, Giza CC, Goldstein JL, Hahn CD, Lerner JT, Loddenkemper T, Matsumoto JH, McBain K, Nash KB, Payne E, Sanchez Fernandez IS, Shults J, Williams K, Yang A, Abend NS. Electroencephalography monitoring in critically ill children: current practice and implications for future study design. Epilepsia, 2013 Aug; 54(8):1419-27. Van Cleve W, Kernic MA, Ellenbogen RG, Wang J, Zatzick DF, Bell MJ, Wainwright MS, Groner JI, Mink RB, Giza CC, Boyle LN, Mitchell PH, Rivara FP and Vavilala MS. National Variability in Intracranial Pressure Monitoring and Craniotomy for Children with Moderate to Severe Traumatic Brain Injury. Neurosurgery, 2013 Nov; 73(5):746-52. Arndt DH*, Lerner J*, Matsumoto J, Madikians A, Yudovin S, Valino HB, McArthur DL, Wu J, Leung M, Buxey F, Szeliga C, Van Hirtum-Das M, Sankar R, Brooks-Kayal A, Giza CC. Subclinical early post-traumatic seizures detected by continuous EEG monitoring in a consecutive pediatric cohort. Epilepsia, 2013 Oct; 54(10): 1780-8. Sanchez Fernandez IS, Sanchez SM, Arndt DH, Carpenter JL, Chapman KE, Cornett KM, Dlugos DJ, Gallentine WB, Giza CC, Goldstein JL, Hahn CD, Lerner JT, Loddenkemper T, Matsumoto JH, McBain K, Nash KB, Payne E, Shults J, Williams K, Yang A, Abend NS. Electrographic seizures after convulsive status epilepticus in children and young adults. A retrospective multicenter study. J Pediatr, 2014 Feb; 164(2):339-346. Poulos AM, Reger ML, Mehta N, Zhuravka I, Sterlace SS, Gannam C, Hovda DA, Giza CC, Fanselow MS. Amnesia for Early Life Stress Does Not Preclude the Adult Development of Posttraumatic Stress Disorder Symptoms in Rats. Biol Psychiatry, 2014 Aug 15; 76(4):306-14. Conidi FX, Drogan O, Giza CC, Kutcher JS, Alessi AG and Crutchfield KE. Sports Neurology Issues in Neurologic Practice: A Survey of American Academy of Neurology Members. Neurol Clin Practice, 2014 Apr; 4(2):153-160. Vavilala MS, Kernic MA, Wang J, Kannan N, Mink RB, Wainwright MS, Groner JI, Bell MJ, Giza CC, Zatzick DF, Ellenbogen RG, Boyle LN, Mitchell PH, Rivara FP for the PEGASUS (Pediatric Guideline Adherence and Outcomes) Study. Acute Care Clinical Indicators Associated with Discharge Outcomes in Children with Severe Traumatic Brain Injury. Crit Care Med, 2014 Oct; 42(10):2258-66. Zemek R, Duval S, Dematteo C, … Giza CC, et al. 2014. Guidelines for Diagnosing and Managing Pediatric Concussion. Toronto, ON: Ontario Neurotrauma Foundation. download free at http://onf.org/documents/guidelinesfor- pediatric-concussion. Yang A, Arndt DH, Berg R, Carpenter JL, Chapman KE, Dlugos DJ, Gallentine WB, Giza CC, Goldstein JL, Hahn CD, Lerner JT, Loddenkemper T, Matsumoto JH, Nash KB, Payne ET, Fernandez I, Shults J, Topjian AA, Williams K, Wusthoff CJ, Abend NS. Development and validation of a seizure prediction model in critically ill children. Seizure 2014 Oct 5; [Epub ahead of print]. Giza CC, Kutcher JS. An Introduction to Sports Concussions. Continuum (Minneap Minn) 2014 Dec,20(6, Sports Neurology):1545-1551. Kutcher JS, Giza CC. Sports Concussion Diagnosis and Management. Continuum (Minneap Minn) 2014 Dec,20(6, Sports Neurology):1552-1569. Choe MC, Giza CC. Diagnosis and management of acute concussion. In press, Seminars in Neurol, 2015. Echemendia R, Giza CC, Kutcher JS. Developing Guidelines for Return to Play: Consensus and Evidence-Based Approaches. Broshek D and Barth J, eds. Brain Inj, In press, 2015; TBIN-2014-0007.R1. Smith AM, Stuart MJ, Dodick DW,…Giza CC, et al., Ice Hockey Summit II: Zero Tolerance for Head Hits and Fighting. In press, Clin J Sports Med, 2015. Carman AJ, Ferguson R, Cantu R, Comstock RD, Dacks PA, DeKosky S, Gandy S, Gilbert J, Gioia G, Gilliland C, Giza C, Greicius M, Hainline B, Hayes R, Hendrix J, Jordan B, Kovach J, Lane R, Mannix R, Murray T, Seifert T, Shineman D, Warren E, Wilde E, Willard H, Fillit HM. “Mind the Gaps”: Advancing research in short- and long-term neuropsychological outcomes of youth sports-related concussions. In revision, Nat Rev Neurol, 2015. NRNEUROL- 14-204V1. January 25, 2015. Dr. Christopher Giza, director of the UCLA Steve Tisch BrainSPORT Program, was interviewed Jan. 25 by KFWB 980AM about how sports concussions affect youth differently than adults. The interview also aired on CBS affiliates in New York and Green Bay, Wis.
October 30, 2013. Dr. Christopher Giza, a professor of neurosurgery and pediatric neurology at the David Geffen School of Medicine at UCLA and Mattel Children Hospital UCLA, was interviewed Oct. 30 by CBS News about concussion in young athletes. The segment aired in 43 markets, including on KCBS-Channel 2 and KCAL-Channel 9 in Los Angeles, and on CBS Morning News. 2014 Zackery Lystedt Angel Award, Sarah Jane Brain Foundation - in recognition of national efforts to prevent and treat pediatric traumatic brain injury and concussions. 2014 Invited guest, President Barack Obama’s White House Healthy Kids & Safe Sports Summit. UCLA Steve Tisch BrainSPORT program selected and highlighted as a Summit Action Commitment.